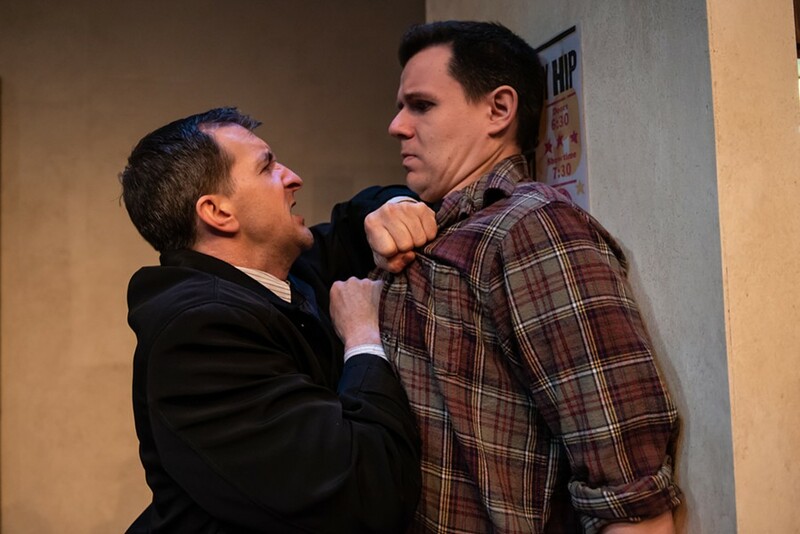 Schwager and Hauk get intense in Drunken God. For Torontonian Jason (Sean Hauk), life is turned upside down when a stranger named Harry (Jeff Schwager) comes knocking at his door with the news that he is Jason’s half-brother. Their father, who abandoned Jason and his mother 30 years ago, is dying of kidney failure. The news of this man’s failing health fails to have any gravitas for Jason, as does Harry’s insistence that he possesses the rare ability to be a life-saving organ donor. With Neptune Theatre’s newest venture, In A World Created By A Drunken God, Ojibwe playwright Drew Hayden Taylor’s subtly poses questions concerning morality and familial obligation. To what do we owe relationships that were never nurtured? Is it acceptable to keep what happened in the past unaddressed and unresolved? Compounding these complex questions is the theme of cultural division. Jason, who was raised by his First Nations mother, identifies himself as Ojibwe. Alternatively, Harry, who hails from the heart of Rhode Island, quickly demonstrates a lack of exposure towards Indigenous culture. Sauk excels as the sardonic Jason—his reasons for not jumping on the operating table are well-founded and transcend mere resentment. Schwager too gives a strong performance about the merits of turning over a new leaf with those we know have wronged us. As the play unfolds, both characters attempt to win the other side over. There’s a relevant, age-old social issue in Taylor’s play here— it’s one that involves reconciliation, accountability and no simple solution.